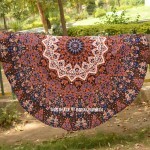 If you are going for a picnicking or for hangout on beach, you need a towel. 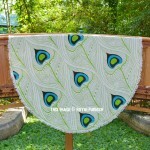 Royal Furnish brings you colourful multi colored peacock wings patterned 100% cotton with tassel (fringed patterned) mandala roundies towels at inexpensive price. It is light weighted but tassel makes it heavy. 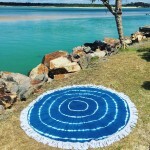 But it is balanced light weighted round beach towel which can be easily carried. 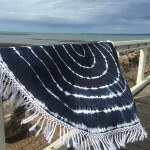 Beach towel is most required accessory for hanging out on beach. 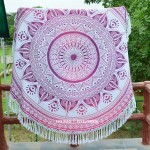 These bohemian Mandala roundies has become a fashion statement to showing up at the beach with vibrant colored piece to sit your hot body on. 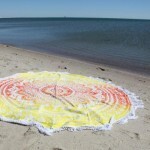 Get a beach photo shoots with round mandala towels and show off your style statement to others. 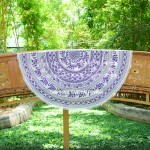 You can also use round tapestries to update your decor. 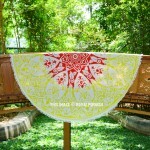 Roundies can be used as a picnic rugs & picnic blankets. These round picnic blankets are easy to pack and value for money. 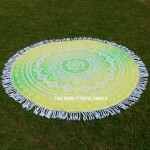 Colorful mandala print blankets are used for sunbathing and picnicking on the beach or park. Comfort is indeed important and we make sure that you have great comfort during your outdoor holiday. 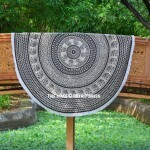 These picnic rugs make your picnic or campaing experience much better and allow you to have more comfort when you are enjoying outdoor holidays with your family or loved one.